Leybold Vacuum Handbook presents a collection of data sets that are essential for numerical calculation of vacuum plants and vacuum processes. 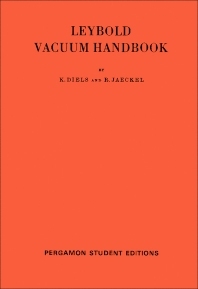 The title first covers vacuum physics, which includes gas kinetics, flow phenomena, vacuum gauges, and vapor removal. Next, the selection presents data on vacuum, high vacuum process technology, and gas desorption and gettering. The text also deals with materials, vapor pressure, boiling and melting points, and gas permeability. The book will be of great interest to engineers and technicians that deals with vacuum related technologies. 2.3 Materials, Vapor Pressures, Boiling Points, Melting Points, Gas Permeability, etc.